When she was Second Lady of the United States, Dr. Jill Biden often ended her days in meetings with some of the most powerful people in the country. The next morning, at a community college in Virginia, she would sit with some of the least powerful, teaching critical reading and writing skills. The two groups were different, but not in the way most people assume. Often, it was a question of opportunity. "I teach veterans seeking to translate their hard-earned skills into the civilian workforce. I teach single moms hoping to make a better life for themselves and their families. And I teach refugees looking to find community in a place they never thought would feel like home. Over and over again, I've seen lives changed," said Biden, who remains a community college professor. 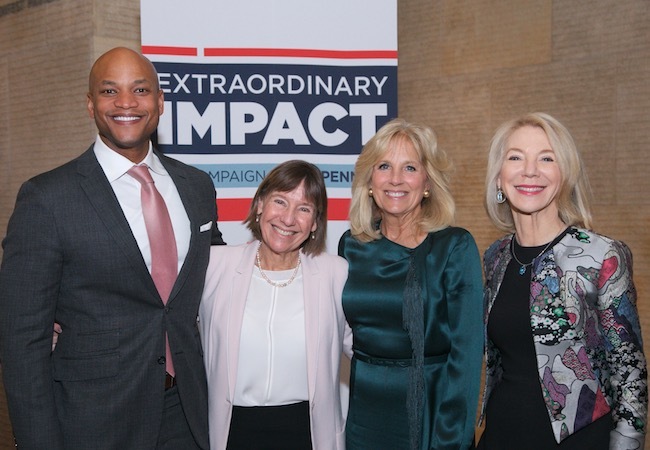 On April 18, Biden joined bestselling author and social entrepreneur Wes Moore, Penn President Amy Gutmann, and Penn GSE Dean Pam Grossman to help launch Extraordinary Impact: The Campaign for Penn GSE. The four spoke to an audience of alumni and friends at an event held at the Barnes Foundation. As part of the University-wide Power of Penn Campaign, the Extraordinary Impact Campaign will enable Penn GSE to continue to hone and develop its core strengths and priorities. "Every day the programs and people of Penn GSE are changing lives for the better, but we can and must do more," said Gutmann. Biden has seen the complex challenges students face throughout her three-decade career in education. With continued effort, Biden believes we can create a sea change in learning that will help us better understand students and their lives, directly address their personal needs, and give them the innovative solutions that they deserve. And, Biden said, Penn GSE has a crucial role to play in that transformation. "That's what teaching is to me, a calling. We get to help people become the best versions of themselves. We get to help them make their dreams a reality," Biden said. "That's what Penn GSE does for every student who becomes a part of this community. This program isn't just about learning. It's about becoming — becoming teachers, professors, researchers, politicians, and entrepreneurs of tomorrow. Becoming the education leaders who will decide our future and spark positive change around the world." Penn GSE’s campaign priorities include providing access to the most qualified students regardless of financial ability, preparing the next generation of education leaders in urban and underserved communities, recruiting and retaining the finest scholars, advancing innovation in education, and building twenty-first-century learning spaces to best meet the needs of Penn GSE students. The campaign will also support school-wide initiatives, including increasing Penn GSE’s unrestricted Annual Fund to provide flexibility in funding the dean’s most critical priorities. "To ensure that all children have the opportunity to achieve their potential, we must invest in education," said Penn GSE Dean Pam Grossman. "To prepare the future health care workers, pilots, engineers, the people on whom our lives literally depend, we must invest in education. To overcome the many complex social challenges related to poverty, both locally and around the globe, we must invest in education." In his book, The Other Wes Moore: One Name, Two Fates, Moore tells the story of another man who shares his name and hometown of Baltimore, but didn't have access to same level of resources or family support. While the author Wes Moore was a Rhodes Scholar, an officer in the 82nd Airborne, an entrepreneur, and eventually a CEO, the other Wes Moore was serving a life sentence for murder. "I stand here today because there were people who were willing to believe in me before I was ready to believe in myself," said Moore, who is now CEO of the Robin Hood foundation. Educators at Valley Forge Military Academy kept working with Moore, even after his repeated attempts to run away from the school. He eventually graduated as his class valedictorian. Counselors at Johns Hopkins found a way for him to earn an education even though he didn't think he could afford it. His story represents that of so many Americans: "People who are one decision, or one policy decision, away from going in one direction, or a completely different direction. People who every day are straddling the spine of greatness, but the problem is they don't even know it." Now more than ever, Moore said, it is critical to prepare the next generation of educators who can show young people a world of possibilities they cannot imagine. "The power of Penn GSE is not just who will walk across your graduation stage," Moore said. "Its power is in the human souls they will touch, whose lives they will nourish, which doors they will open, which narratives they will change." An on-campus launch event for the Extraordinary Impact Campaign will take place during Penn’s Alumni Weekend on Saturday, May 12. View photos of the April 18 event.